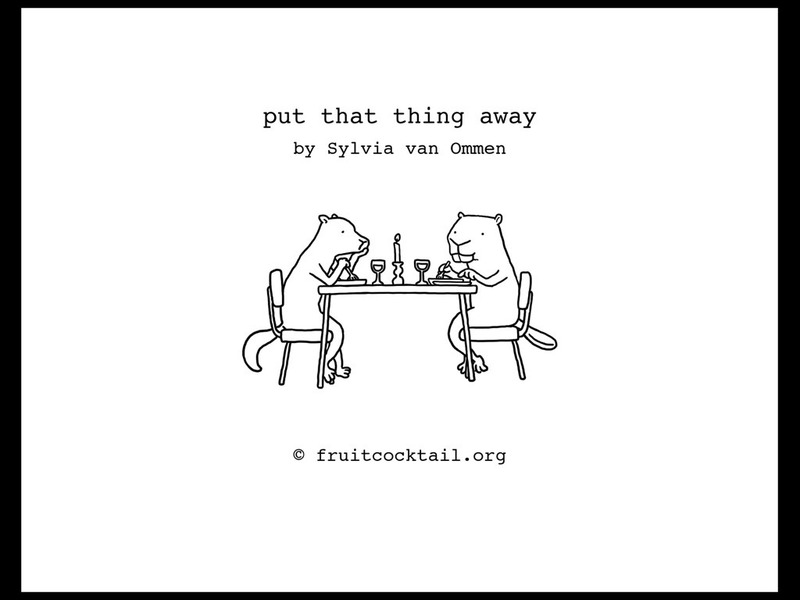 Put that thing away is a new humorous, illustrated iBook all about life with an iPad. 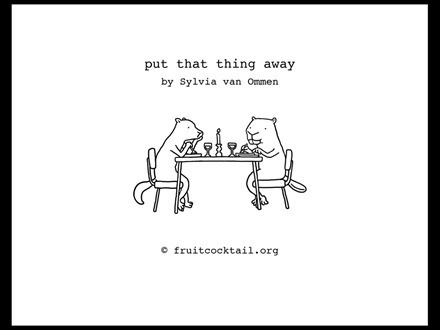 It’s the creation of Sylvia van Ommen – a simple picture book with no text that offers a look at modern living with an iPad. I’m an illustrator and writer and I made this story when my partner got an iPad. His enthusiastic and frequent use of this new gadget inspired me to make ‘Put That Thing Away’. I just got an intro email about the book this morning and it sounded fun – so I installed it and browsed through the book earlier this morning. 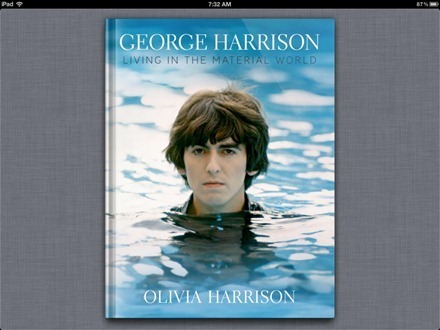 New in the iBookStore today is George Harrison Living in the Material World, which Apple describes as a Multi-Touch book. I’m not the world’s biggest Beatles fan, but I like Harrison quite a bit, and While My Guitar Gently Weeps is one of my favorite songs ever. I’m also very interested in titles like this one that bring multi-touch and multimedia elements into iBooks – so I purchased this one this morning. And I’m very happy I did. I’ll try to do a proper review when I’ve had a chance to read the whole book – for now I’ll just say that my first impressions are very good. I enjoy good biographies and though this book doesn’t set out to be a full biography of Harrison, it looks like it offers a fantastic look into his life. I love it how a few days after the Consumer Electronics Show 2012 in Las Vegas ended, where people lustily obsessed over 55-inch wafer-thin screen TVs, Apple has got people talking arguing about education reform. 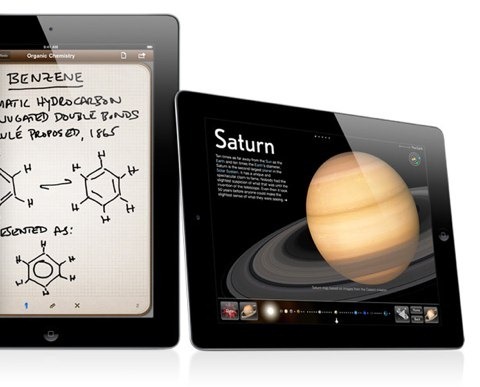 Two years after launch, Apple has now unwittingly made the use of iPads in the classroom the topic of discourse and mild controversy. Finally. iPad transforms the way you work. 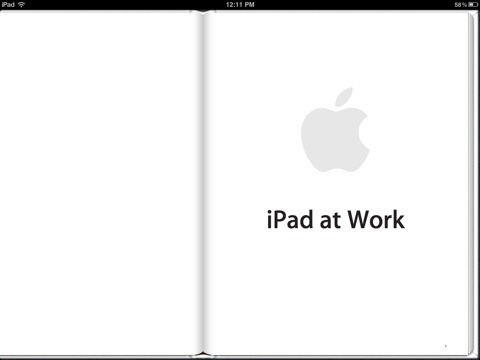 Learn how iPad features and applications can help businesses get the job done. It’s clearly a book aimed at showing that the iPad is much more than just a device for ‘consumption’ and that it’s a very capable tool for business users. The main sections cover topics like Access and Manage Documents, Powerful Presentations, Mobile Meetings Made Easy, Notable Notes, Convenient Collaborations, and Profile Snapshots. Profile Snapshots are very short case study type overviews of how 10 companies are using the iPad in their business. I downloaded the app a short while ago and I have to say one of my early impressions is that this is a very, very un-Apple-like eBook. The text on its pages is not sized well for viewing on the iPad – it’s too small. I took a quick glance over at a couple other iBooks titles I have – the iPad User Guide by Apple themselves and Enchantment by Guy Kawasaki, and confirmed that both of those have far, far better and more iPad-like designs. This latest Apple title really looks like one of those quick-fire PDF translations that some of the poor iPad magazine titles have offered up. It’s rare that Apple releases an app or product that looks shoddy, but my clear first impression is that this eBook falls into that category. I’ll spend more time with the eBook and likely do a proper review of it sometime soon. 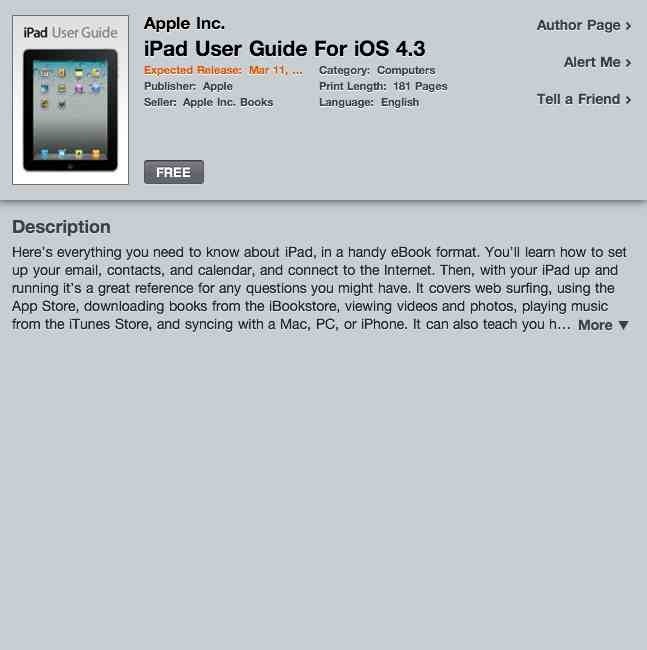 Here’s an iTunes link for iPad at Work; it’s a free eBook. Apple is releasing a new User Guide for the iPad running the soon-to-be-released iOS 4.3, which is set to release on March 11 like the iPad 2. The guide looks like it will cover all the basics of using the iPad – including topics like email setup, using Safari to browse the web, using the App Store, syncing with a PC, and so on. It’s a free eBook, and is available for ‘pre-order’ right now in the iBookstore. 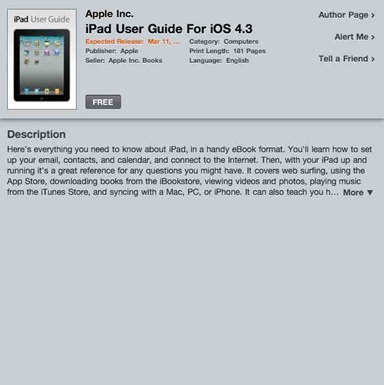 It adds the book to your library, and presumably will download it once iOS 4.3 is released on March 11th. This week the iBookstore has added over 15,000 new titles, from Random House – including bestsellers by Stieg Larsson, John Grisham, Danielle Steel, Bill Bryson, and more. 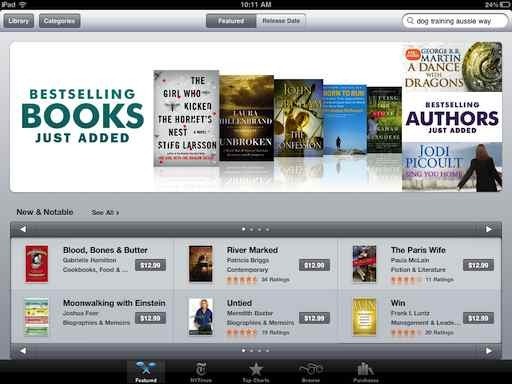 Random House is the latest major publisher to bring their content to iBooks. 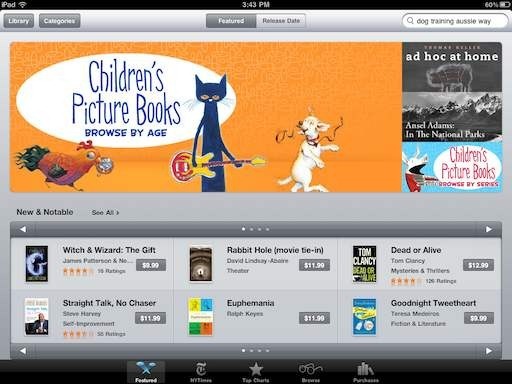 It’s good to see the iBookstore content expanding, as I’m finding I use the store more and more lately. For young readers, pictures and words are equally important. Now, with the latest version of the iBooks app, you can enjoy your favorite children’s picture books in gorgeous, full-color, two-page display on your iPad, iPhone, or iPod touch. Download iBooks 1.2 and browse our collection of newly added picture books, from Ian Falconer’s Olivia and Jane O’Connor’s Fancy Nancy to Nancy Tillman’s heartwarming classic, On the Night You Were Born. Have you ever started reading a long article on the web and thought that it would be great to be able to read it in iBooks on the iPad? If so, did you know it’s quite easy (on a Mac) to print a web page as a PDF to iTunes and read it later on the iPad (or iPhone) in iBooks? Double-tap an image within a book to view it in greater detail. Experience books that include audio and video. Enjoy substantial performance improvements when reading PDFs. Look-up definitions to English words inside books without a specified language. Addresses an issue that may have caused some book downloads to not complete. 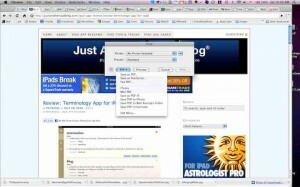 Includes many stability and performance improvements. I honestly haven’t been using the app enough of late to really notice these enhancements (have been reading mostly standalone titles). If you’re a big iBooks user, let us know in the comments what you think of this latest update. 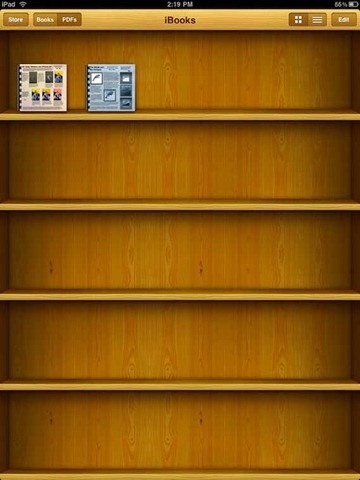 iBooks 1.1 Update Not Doing All It Promised with PDFs? TUAW has a recent post up stating that the iBooks 1.1 update is not delivering all the new PDF-related features that it promises. As shown in TUAW’s screencap above, the two features in particular that are not working with PDFs are the ability to flip through pages and to highlight text on pages. I’ve had a quick try with a couple of different PDFs on my iPad and found that these features do not work for me. Just as TUAW’s article suggests, pages turn via swiping not flipping as eBooks do, and the text highlighting functionality just isn’t there at all. Are any of you seeing any different with the iBooks 1.1 update? Hopefully this is something that will be addressed in another update for the app soon.